On Tuesday afternoon, long after the halls at Cesar Chavez Elementary School on Shotwell had long been emptied of children, teachers prepared to attend a rally protesting the budget cuts. That effort later failed. The bill passed. Even before Tuesday, teachers said, they could see the signs of layoffs because they’ve been through this before. A young protester supports his teachers. Gov. Schwarzenegger has proposed a $10.8 billion dollar cut in the education budget, meaning more teacher layoffs, increases in class size, and decreases in school resources, according to the United Educators of San Francisco. California has already dropped to 47th in the country for school funding—$7,571 per year per pupil, $2,400 below the national average. Ceasar Chavez’ s 442 students score so low on state tests that it has been moved into program improvement, meaning the school must pass No Child Left Behind standards or face intervention. Improvement is made difficult by diminishing resources that lead to the removal of education-enhancing programs, like summer school. Baranda-Larin has seen the program go from all-inclusive to only for special needs and newcomer students—leaving many students without options for summer care or activity. Lucy Mayoral, who has taught for a total of 14 years, three of them at Cesar Chavez, said it was hard to live with the insecurity of who will be laid off. “We put our blood, sweat and tears into those classrooms, and we take it home with us everyday, and to just be pushed out?” said Mayoral. They think it’s unlikely they’ll get the same reprise they did last year when eight teachers received pink slips. “I was one of them,” said Jade Rivera, a third-year kindergarten teacher at the school, who along with the other teachers, was reinstated after the city used some of its rainy day funds. “The people who received the layoff notices, we all graduated from teaching school at the same time and started teaching with the district at the same time,” Rivera said of the eight teachers who received the threat of layoffs last year. The San Francisco United School District makes the decision on layoffs by seniority. Teachers at Cesar Chavez have recently been asked to verify the number of years they have been teaching in the district. “That was the first notice we received [of the layoffs] last year from the school district. It feels very vulnerable,” said Rivera. 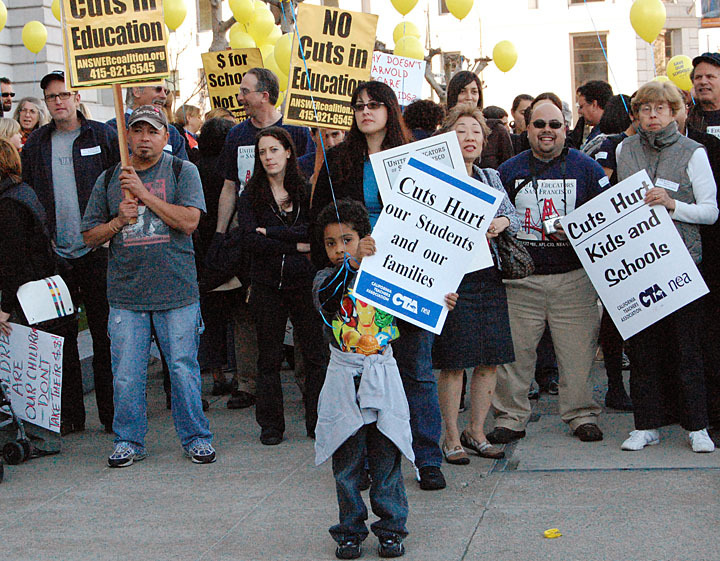 Already, other Bay Area schools have announced layoffs. Hayward plans to layoff 170 teachers and increase class sizes from 20 to 32 students. “I just wish they could see what goes on at the school. It’s more than what goes on paper,” said a passing teacher who has been at Chavez for two months. It was why, they said, they attended the protest at city hall. “The teachers at Cesar Chavez, they’re fighters,” said Matthew Hardy, spokesperson for United Educators of San Francisco.